FOOD MATCH: This cousin of red Burgundy is versatile with many food pairings. It sang for us with bowls of linguine Cacio e Pepe coated in Parmigiano and freshly ground black pepper. WHEN TO DRINK: Sooner rather than later, but there’s no reason a bottle shouldn’t keep until next year’s Nouveau comes in. This exceptional Nouveau is well worth its $11 average retail shown on Wine-Searcher.com. 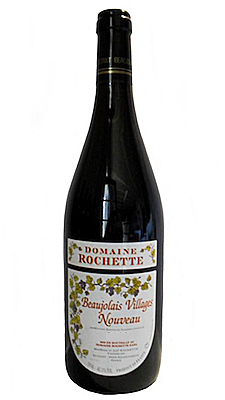 Here’s a fact sheet in English from Domaine Rochette. This page covers all their Beaujolais wines, ranging from Nouveau to some very special single-vineyard Cru Beaujolais. Look for vendors and check prices for Domaine Rochette 2017 Beaujolais Villages Nouveau on Wine-Searcher.com.